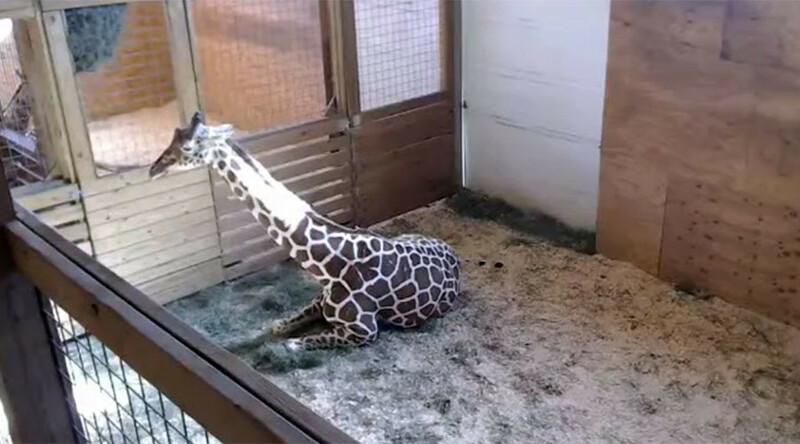 Over 100,000 people have now tuned in to a livestream of April, the giraffe who is due to give birth at a New York zoo any minute. Aside from a minor, and bizarre, setback for allegedly showing “sexually explicit content”, April has been captivating her curious audience with her impending labor for a week now. The buzz surrounding the live birth of April’s calf has reached an all-time-high since she was placed on official baby watch on February 23rd. Zookeepers at the Animal Adventure Park in New York have been busy keeping impatient viewers occupied by answering rumors, complaints, and queries relating to April and her partner Oliver. For what it’s worth April is 15, this is her 4th calf and the 1st for five-year-old Oliver. Giraffe’s are pregnant for 15 months, her newborn will weigh about 150 lb, measure at around 6ft tall...oh, those “things” on her head are called ossicones. April still hasn’t given birth at the time of writing.